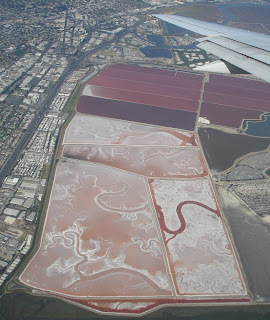 This is the Redwood City Saltworks, owned by Cargill, from a United Boeing 757-222 on approach into SFO. The satellite image of the area is equally beautiful. I've cycled on similar land further south along the bay, at Guadeloupe Slough off Sunnyvale Baylands Park. It's a really strange surface to cycle on. The salt crust is wonderfully smooth, but there are hidden dimples and potholes in the surface that make riding generally unpleasant.